This year the significant for our country event is celebrated, it is the 25th anniversary of Independence of the Republic of Kazakhstan. During several centuries the people of Kazakhstan after passing the path of colonial past and totalitarian Soviet regime, consistently advanced to their ultimate dream about the independence. The sovereignty to the people of Kazakhstan was too high a price to pay for in the struggle with foreign enemies, in anticolonial national-liberation wars, in Soviet political repressions, in “1000 deaths and 1000 resurrections”, wrote the akyn Zh.Moldagaliyev. The most important achievement of sovereign Kazakhstan is keeping domestic political stability which is provided by consecutive and reasonable national policy of the state, also historical experience of many-centuries traditions of ethno-cultural variety and tolerant communication. In modern Kazakhstan in accordance with the Constitution were created necessary conditions for the expression of interests of ethnoses and consolidation of national unity. The conducted state politics directed at the preservation and development of cultural diversity, conduces to the best communication among people, who occupy united social area. Dynamic, stable development of the country is the presence of medium term and long term strategies, among which a special place is taken by the National Unity Doctrine. In this program document on the basis of generalization of experience are clearly defined the principles of national politics: “One country – one fate”, “Various origin – equal possibilities”, “Development of national spirit”. All these principles are justified and successfully realized in the country. About that testify, particularly, data of last sociological research on which 95% of all Kazakhstani people consider: “We are representatives of united people of Kazakhstan”. The Assembly of People of Kazakhstan in Pavlodar oblast makes contribution to the realization of the National Unity Doctrine. In the region nowadays huge experience in fortification of political stability and interethnic accord is accumulated. Today, significantly strengthened and widened the interaction of ethno-cultural unions with state bodies. 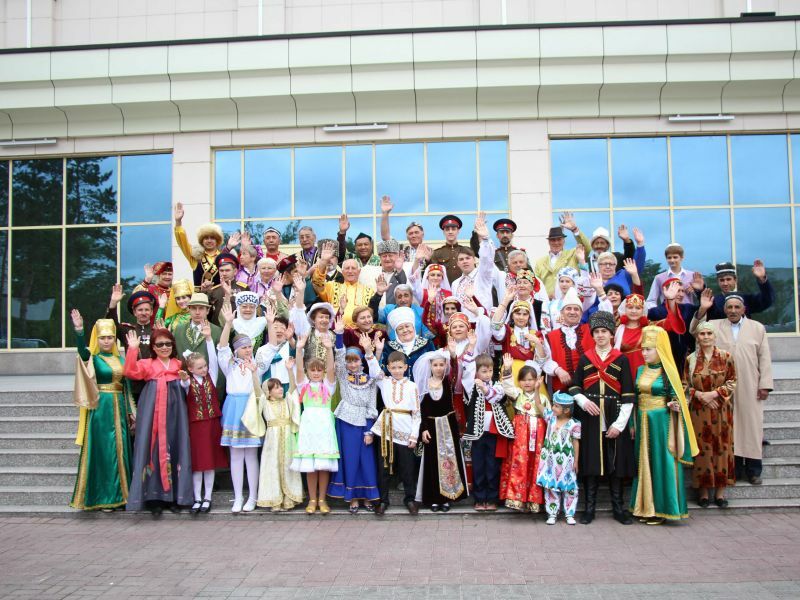 They realize the complex of measures directed at the formation of Kazakhstani patriotism, education of respect for state language, culture and traditions of all the ethnoses of Kazakhstan. Now it can be said about new qualitative level of activity of ethno-cultural unions. It is expressed in wide representation of ethnoses in the work of certain ethno-cultural unions. For instance, in Korean center participate not only Koreans, but also Kazakhs, Russians, Tatars and so on. The main task of their activity becomes the working out the ability to perceive the world not only from the position of their ethnos, but also be able to evaluate acts from the position of national interests. Formation of national identity of tolerance is realized in all institutions of education. In universities since 2014-2015 yy. function the departments of the Assembly of People of Kazakhstan, In Pavlodar State University named after S.Toraigyrov along with the department of the APK successfully act the dialogue areas with the participation of scientists-experts, students youth, ethno-cultural unions on the problems of formation of national unity and inter-ethnic tolerance, the special attention was to the explanation of values of national idea “Mangilik El” which as, it is known, was adopted last year, at XXIV session of the Assembly of People of Kazakhstan. In this program document was fortified national idea of the state about Eternal country, based on standing the test of time values. Independence of Kazakhstan and Astana, national unity, peace and accord in the society and high spirituality, economic growth on the basis of industrialization and innovations, the Society of Common labor, unity of history, culture and language, national safety and global participation of the country in the solution of world and regional problems. In President’s opinion owing to these values Kazakhstani people always won, strengthened the country, increased great successes. And these national values are the guarantee of prosperous future. Language future in the Strategy of Kazakhstan is connected with three languages: Kazakh, Russian and English. Along with adhering to the Constitution principle on equality of all ethnoses living in the republic all the conditions for development of their native languages and culture are created. Annual tradition became the celebration on 22 September of the Day of languages of people of Kazakhstan. Such politics, undoubtedly, fortifies national unity, develops and enriches the culture of the country. What is the reason behind naming or renaming the capital cities?